This issue of Hematology/Oncology Clinics of North America, guest edited by Drs. 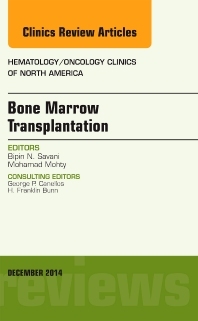 Bipin Savani and Mohamad Mohty, is devoted to Bone Marrow Transplantation. Articles in this issue include: Acute Myeloid Leukemia (AML); Acute Lymphoid Leukemia (ALL); Myelodysplastic Syndrome (AML); Myeloproliferative disorders (MPD); Chronic Lymphoid Leukemia; Chronic Myeloid Leukemia (CML); Multiple Myeloma and Amyloidosis; Non-Hodgkin Lymphoma (NHL); Hodgkin Lymphoma (HL); Severe Aplastic Anemia (SAA) and Paroxysmal Nocturnal Hemoglobinuria (PNH); Sickle Cell Anemia; Thalassemia; Benign immunodeficiency diseases; and Referral to transplant centers.